Note:Dindayal Yadav, ship breaking worker died around 11 PM due to fatal burns from Alang fire. Convicted US Ship Platinum II to get breaking permission? New Delhi:Following huge oil spill in the sea waters at Alang beach, a major fire has broken out in the Plot No. 27 of Budha Patel around 1 O' clock in the after noon. Patel is the owner of Shantamani Enterprise. So far 6 workers are reported to be almost dead. There was too much oil in the sea that got leaked from the ship. The fire engulfed the whole ship. More casualties are expected as the search is still on. The fire and smoke is still visible from Sosiya village in Bhavnagar district. At least 100 labourers were dismantling the ship. Alang Chief Fire officer P D Vyas has said that it’s a major fire. Gas cutting work was on when the fire started. The Fire Department has said that the exact cause will be known only after the fire is extinguished. Of the six killed, two are muakadam (labour contractors) and 4 are workers. There casualty is expected to be higher because there were many workers engaged in dismantling when the ship was surrounded by fire. Efforts to control the fire are on. The ship which caught fire is named MV Devsi. It arrived on 3rd February, 2010 and beached on 15 February. Its a motor tanker. Three people injured are: Ram Singh Yadav, Pappu Kumar Gaud, Bind Dayal Yadav. All of them admiteed at Dr.DB Parekh Hospital at Bhavnagar. Alang coast has a tidal range of around 13 meters, making it easier to beach a condemned vessel directly onto the shoreline. This plot is one of some 130 plots are in use today. Till June 1983 the Alang beach was in its pristine state, which was been polluted by the hazardous wastes laden end of life ships of the industrialized countries under the supervision of Directorate General of Shipping. 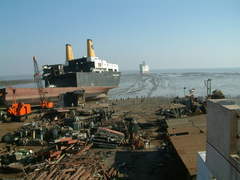 In the meanwhile, sources reveal that Supreme Court's delay in the hearing of the matter regarding hazardous wastes related to shipbreaking in general and US ship Platinum II (MV Oceanic, SS Independence) that is lying illegally anchored at Bhavnagar Anchorage Point has created an atmosphere of non-regulation of the ship-breaking activity. Sources have informed that the permission to dismantle the US ship at its anchorage point itself appears to be have been given. Rampant corruption and acts of omission and commission of Gujarat Maritime Board (GMB) is evident in the manner which the report of the channel blockage due to US toxic ship, Platinum II was sent to Union Environment Ministry. As of today the ship breaking plots at Alang in Gujarat has about 166 ships to dismantle. In the 2009 about 260 ships were recycled, several dozen ships came to Alang in the aftermath of the arrival of Platinum II. This ship which has been engulfed in fire too came after the anchoring of Platinum II. DV (Dead Vessel) Platinum II, Ocean Liner (IMO No 5160180) arrived Gujarat coast on October 8, 2009 for Anchoring, Beaching, Dismantling, Disposal and Recycling at Alang – Sosiya Ship Breaking yard, Gulf of Cambay near Bhavnagar. A Central Technical Team constituted by the Ministry of Environment and Forests (MoEF), Government Of India (GOI) had assessed the hazardous materials/wastes contained in the ship, including Poly-Chlorinated Biphenyls (PCBs), Asbestos and Radioactive substances and on November 09, 2009 MoEF disallowed beaching and recycling of the ship at Alang for violating US Toxics Substances Control Act as the ship owners Global Shipping LLC and its affiliated company Global Marketing Systems, Inc. were fined a total of $518,500 to resolve Toxic Substances Control Act violations and because the vessel reached India with fake documents on national registry and flag. Despite the above order, Directorate General of Shipping has not sent the ship back. In the face of such routine fires, oil spill, fake documents in sea waters near Alang, the silence of Directorate General of Shipping, Mumbai, the Ministry of Shipping is quite puzzling. This illustrates the lackadaisical approach of the Ministry. It is because of such criminal dereliction of duty on the part of the officials from Ministry of Shipping in particular that over the years Alang has been turned into not only the graveyard of ships but also of workers. The ship breakers' yards stretch a full seven miles along the coastline of the Indian state of Gujarat, which has been contaminated with oil spill, hazardous wastes and micro-organisms due to the connivance of the Ministry of Shipping. In the second week of March, 2010 too, one of the four persons who were injured in a fire that broke out in a ship while it was being dismantled at plot number 123 of Alang ship breaking yard has died. In the Minutes of the meeting of the Inter-ministerial Committee (IMC) on ship breaking held on 04.02.2009 under the Chairmanship of B.S. Meena, Additional Secretary and Financial Adviser (AS&FA), Ministry of Steel, it is noted that the Coast Guard representative and the Naval HQ representative had "expressed apprehensions that the vessels coming in for beaching sometimes ply very close to the oil rigs, which could be a potential for accidents." The IMC must revise its position in the light of these accidents. Earlier, six labourers were burnt alive in an engine room at Alang ship breaking yard on 4/8/2009 on plot no. 24 in the morning at Alang in the premises of Alang Auto & General Engineering Co. (P) Ltd were cutting down the engine portion of ship ‘M S Jesica’ in the world’s largest ship scrapping yard. Such things happen in a routine manner in Alang. Union Environment Secretary headed Supreme Court-appointed committee in its report has revealed that the fatal accident rate in Alang is in the range of 2 per 1000 as opposed to 0.34 per 1000 in the mining industry (which is considered worst in the industrial sector). Two fatal accidents have been reported from the world’s largest ship-breaking yard in May and June 2009. Evena earlier accident that occurred on the 1st June, 2009 on Plot 15 of the ship-breaking yard involved a labourer identified as Ayodhyasingh Rajput. Such fatal accident occurred at Plot 24 D in May, 2009 as well. Similar accidents were reported in earlier months and years as well. The industrial activity must be taken off the Alang beach to protect these dying workers and the coastal environment. The currently practiced “beaching method” whereby obsolete ships are run aground on ocean beaches for cutting and breaking apart in the intertidal zone can never be accomplished in a manner which is environmentally sound or protective of human health. No amount of prescriptive improvements or protections can remedy the four fatal characteristics of intertidal beaching operations required in the ship-breaking activity. First there is the impossibility of containing pollutants on a tidal beach where hulls of ships are often breached accidentally or by cutting, or toxic paints erode or are abraded sending persistent organic pollutants, heavy metals and oils onto the beach and into the seawater; Second, due to a shifting and soft wet tidal sand surface, there is the impossibility of rapidly bringing emergency response equipment, including fire-fighting equipment and vehicles, ambulances and cranes along side the ship, to assist or remove persons hurt inside the hull; Third, the impossibility of allowing cranes to work alongside to lift heavy cut sections of a ship and thereby preventing heavy cut sections from being subject to gravity, shifting or falling directly into workers or into the marine environment; and Finally, there is the absolute incompatibility of conducting hazardous waste management operations (which is what they are as long as ships contain hazardous wastes, in the ecologically delicate and vital coastal zone. The end of life ships are never safe and ship owners know it but gullible ship breakers in their lust for profit make Indian workers and environment the sacrificial goat. 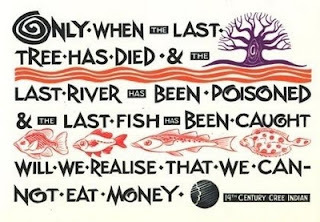 The older a ship is the more human and environmental costs are associated with it. Consequently, ship breaking is deemed a viable option by the ship owning countries like Europe and US who wish to escape such costs.